Cultivate from seedlings with root clod. At least 50 cm (20 in) between rows and at least 50 cm (20 in) between plants. You can plant bush beans or peas in the space in between. Two to three plants per person. From April to mid-June for seedlings. Transplant overwinter sorts in mid-June at the latest. Seeds germinate in 10 days. It needs a lot of nutrients. Fertilize with barn manure or home compost. Additionally, water with comfrey or nettle brew and use organic mulch. Be careful about the lack of boron. It is not needed, except for transplanting in drought. Beans, peas, spinach, Swiss chard, broad beans, chickpea, lentils, celery, potato, Indian cress, dill, chamomile, sage, peppermint. It is quite resistant; be careful about butterfly caterpillars and flea beetles. Pick regularly, before the sprouts open (but even the open ones are edible). Store in the fridge, unwashed, for a few days. Even when frozen, Brussels sprouts keep their characteristics for a long time. Blanch shortly and put in cold water before freezing. The sprouts can be eaten raw, but usually cooked. To keep as much beneficial substances in, cook as shortly as possible in a little water or steam. Use sprouts, as well as the plant’s tips for soups and sauces. 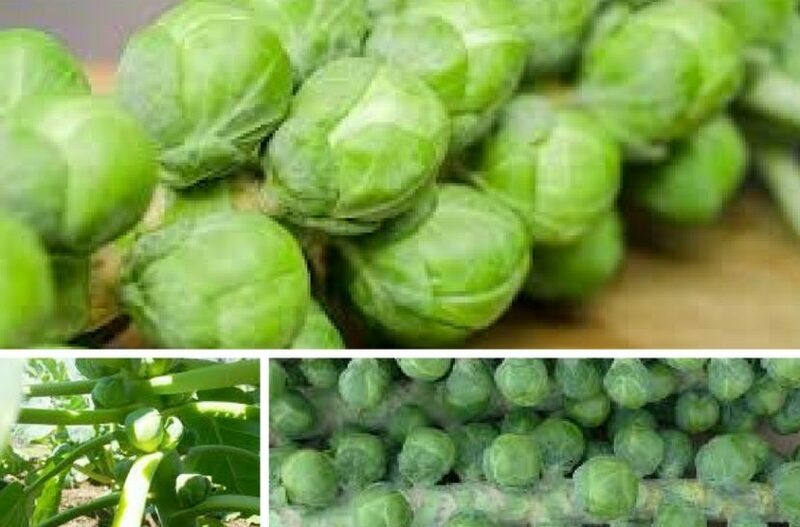 Cut off the leaves only if you want to accelerate the ripening of sprouts. The leaves are needed otherwise for protection against cold. In fall, cut off the plant’s top to accelerate ripening. The plant can survive winter, if you don’t exaggerate with nitrogen fertilizers. It’s good to lay the plants on the ground for snow to cover them. It is different than Savoy cabbage. It contains the majority of beneficial substances as cabbage and can survive lower temperatures.